When most people hear the word “shark,” images of sharp teeth and fins slicing menacingly through the water instantly come to mind. Indeed, sharks include some of the planet’s most efficient killers: they are powerful hunters able to catch thousand-pound tuna, small whales, and occasionally people, with ease. But as NATURE shows, not all sharks are sleek killing machines. The Secret World of Sharks and Rays reveals that the ocean’s 350 species of sharks have many eating habits and come in all shapes and sizes — from gentle 50-foot giants that graze on plants and tiny crustaceans to bizarre-looking bat-faced dwarfs that rarely budge from their cozy burrows on sandy sea floors. The Secret World of Sharks and Rays also reminds us that, while sharks get more attention, the seas actually hold many more kinds of their close relatives, the rays. Scientists believe the oceans support thousands of species of these flat fish, which use their wing-shaped bodies to soar through the depths. Researchers do know that sharks and rays are some of Earth’s oldest fish. Once, more than 400 million years ago, the two groups shared a common ancestor that swam through the planet’s oceans long before the first dinosaur appeared. Today, to the untrained eye, that common origin isn’t obvious, because most sharks and rays look so different from one another. But the fish are, in fact, relatives with structural similarities. Instead of bones, their body frames are made of cartilage: the tough, fibrous tissue that gives our noses and ears their shape. Sharks and rays also share the same kind of skin: instead of scales, they have small tooth-like spikes called denticles. The spikes can be so sharp, in fact, that carpenters have long used shark skin as sandpaper! Sharks and rays also share some acute senses, such as smell and the ability to detect the mild electric currents produced by other animals — including potential prey. 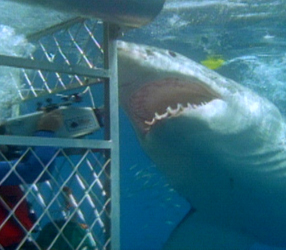 Some sharks are reputed to be able to detect minute quantities of substances such as blood in water from several hundred feet away. Though huge fossilized teeth suggest that larger sharks once existed, today the largest species is the Whale shark, a gentle 50-foot long fish featured in The Secret World of Sharks and Rays. Despite its size, the Whale shark feeds on some of the ocean’s smallest life, the tiny plants and crustaceans that drift near the surface. Even an infant two-foot long Whale shark, however, is longer than the world’s smallest sharks, such as the 10-inch long Dwarf shark, or an even smaller species named the Pygmy Ribbontail catshark. In fact, fewer than 50 shark species grow to be longer than six feet, and most rarely reach three feet long. Sharks also vary in lifestyle. Sleek Mako sharks, for instance, may spend their days cruising the seas at up to 40 miles per hour, hunting fish and occasionally launching themselves into the air with acrobatic leaps. Angelsharks, however, prefer a more sedate existence. They bury their camouflaged, flat bodies in the sandy sea bottom and wait for unsuspecting crabs to scuttle by. Most sharks, however, have to keep moving to breathe and stay alive. That’s because they breathe by swimming forward with their mouths open, allowing oxygen-filled water to sweep across their gills. The majority cannot stop for long or move backwards, as can most other fish. Some sharks grow to be only a foot long. Despite this limitation, sharks have found ways to survive in virtually every oceanic nook and cranny, and they can have lifespans of more than 100 years. They eat everything in the water, from squid to seals. The Cookiecutter shark even survives by using a suction cup to attach itself to whales and large fish, then carving out a core of flesh with scalpel-like teeth. Only three dozen shark species, however, have ever been known to attack humans, usually by mistake. Off Australia, for instance, Great White sharks have been known to attack surfers — perhaps because the combination of surfer and board looks like a seal playing in the waves. While people are sometimes injured or killed in the attacks, often the shark gets only a bite of surfboard. Whatever their lifestyle, sharks and rays share some of the most interesting child-rearing habits in the world of fish. While some species lay eggs — known to beachcombers as “mermaids’ purses” because of their soft, envelope-shaped shells — deep sea sharks give birth to live young who are ready to live and eat on their own. 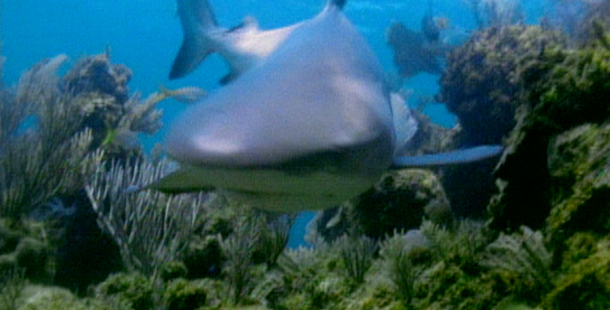 In fact, in the case of some live-bearing sharks, such as the Blue shark, baby sharks growing within the mother’s womb may have already consumed a few meals before being pushed through the birth canal: they eat some of their smaller brothers and sisters in a remarkable form of pre-birth cannibalism that researchers believe helps promote survival of the fittest. Unlike the many fish that lay millions of eggs at a time, sharks bear relatively few young. Some egg-laying species can have more than 100 pups at a time. In sharp contrast, the deep-sea sharks usually give birth to just one or two young. This slow reproductive pace, unfortunately, threatens the survival of some sharks. Overfishing of some sharks is becoming a serious problem, Musick and other experts agree. As The Secret World of Sharks and Rays shows in sobering footage, some sharks are taken for their tasty meat. But others are killed just for their fins or cartilage, which are considered potent medicines in some parts of the world. Once the sharks are “finned,” their bodies are tossed overboard. Worldwide, fishing fleets kill an estimated 100 million sharks a year; scientists believe some species’ populations could be dropping by up to 2% per year. If nothing is done, researchers say, some species could become extinct within 50 to 100 years. Some governments, however, are moving to protect sharks. In the U.S., for instance, Musick and other scientists helped convince regulators to scale back a growing East Coast shark-fishing operation that threatened some populations. Other conservationists are hoping that a growing interest in sharks as “watchable wildlife,” to be viewed by divers on underwater safaris, will create economic incentives to leave sharks in the sea rather than put them on the plate. As more people enter the fishes’ secret world, conservationists hope sharks will gain more fans committed to protecting them.